I took this photo eleven years ago, when I took the summer off, packed my car with my dog, my camera, and my camping gear and headed out all over the Northern US and up into Canada. Oh, it was a good summer. I wasn’t a professional photographer at that point, just someone who had been taking photos since I was a young girl, and who just loved it. Nature and landscapes were what I took, as that’s what I did. And on this trip, I saw more than I had ever seen before. 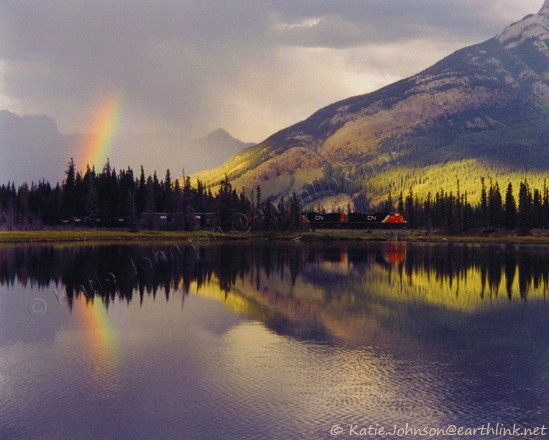 My favorite place on this trip was a place that stole my heart — Jasper National Park in Alberta, Canada. To this day, it still ranks as the most beautiful place I’ve ever been, with so much nature and wildlife, and some really nice people too. It felt like home to me, and someday I hope to make it back there. It truly is a special place. I don’t have very many of my old film images digitized, but this one just brings back such wonderful memories, and I still do like this image. Shot taken with a Minolta Maxxum 3xi (consumer film 35mm SLR) with a 70-210 lens and scanned into the digital world. Image Copyright © Katie Johnson. All Rights Reserved. A while ago, I posted some abstract rain drop photos that were very popular, so I thought it’s about time to show another rain drop photo; this time a more normal one. 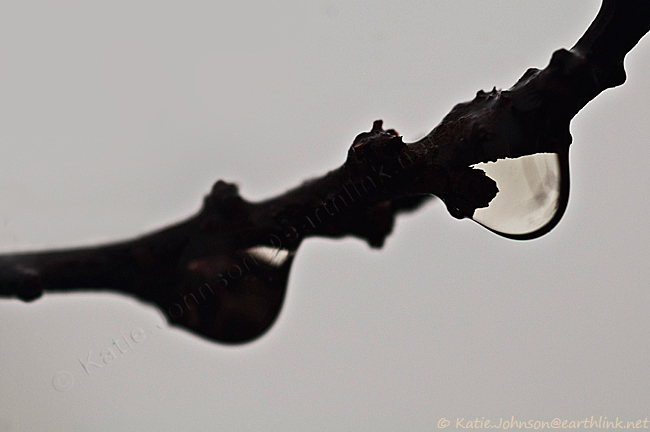 This photo was taken in the same time frame as the other ones (we don’t get much rain in Santa Fe, so not many chances to take photos like these), but these drops have a more natural look. 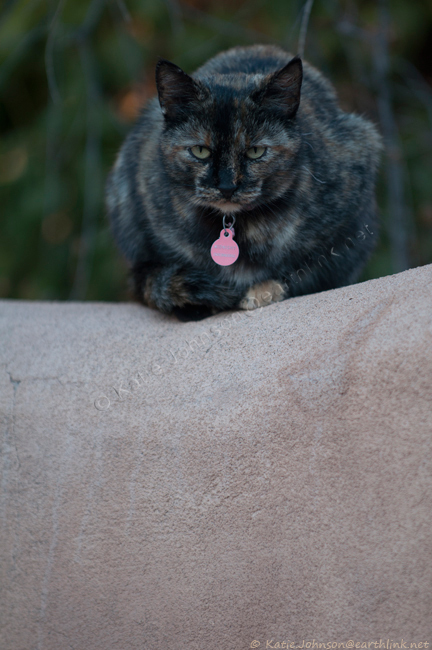 Shot with my 105mm lens at f/4.2. Here’s the 24th installment of “A Simple Pretty Flower for a Sunday.” If you’d like, you can view all the earlier Sunday flower images/posts on this page. Not much to say about this little one. It’s just a simple flower that I found on a walk in late October last year — a flower that was still enjoying the most of the sunlight that was becoming shorter with each passing day. Here’s hoping you have a wonderful Sunday! 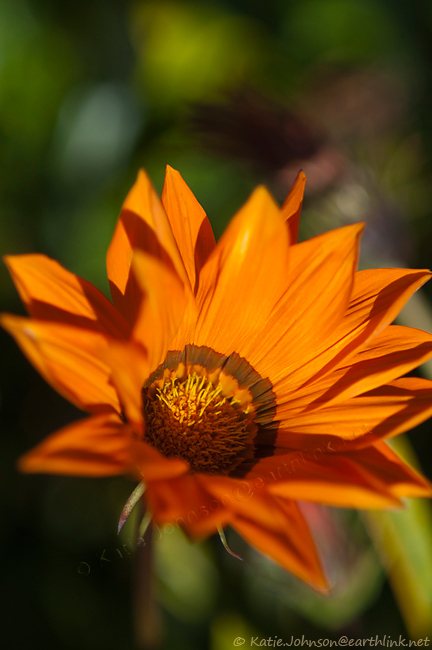 Shot with my 105mm macro lens at f/3.3. Time for some more Saturday Silliness. (: To see the previous silly posts/ images, please click here. Thanks Midnight kitty for modeling for me! Hope everyone has some silliness in their weekend! Shot with 70-200 mm lens at f/2.8. Tags: Cat, dog, fun, humor, not amused, pet, photography. Here’s another Nice and Normal photograph. If you’d like, you can see the other images here. Way back when, I posted a cool photo of some concrete barriers at night. I took this image on the same evening. On the other side of the New Mexico State Capitol, there is a parking garage, that is just fine, but not something I’d like to really take photos of for its architectural merit. But put some darkness around it, and oh yeah, I’d like to shoot it. (: Night, well actually dusk, brings drama to a subject, and it also isolates and simplifies it; the way I like my photos. 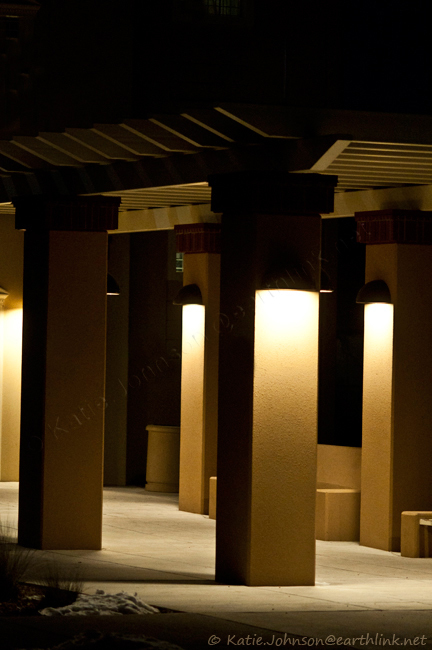 So I shot the pedestrian entrance to the parking garage, and here it is. As a note, I didn’t use a tripod, although I should have. Being that it was night, I pumped the ISO all the way up to 2200, which allowed me to handhold my lens at a shutter speed of 1/160. That high of an ISO added some noise/pixelation into the image, which would be distracting if the photo was enlarged, but for this size, and with not trying to lighten the shadows, it’s fine. Shot with my 105mm lens at f/2.8. Time for another portrait of a leaf. If you’d like to see the other portraits of leaves, you can see them at Portrait of a Leaf. Ah, I miss the sun of winter. Even in early afternoon, I could still get some shots I liked. But now, the sun is just too bright again. Ah well. 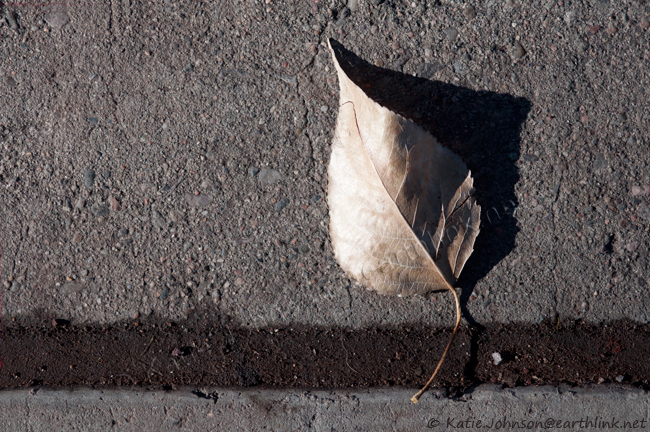 Anyhow, this leaf was found in late December. Just sitting there, like she was resting after crossing over the line in the sidewalk. Shot with my 105mm macro lens at f/4,5. Shot with my 35-70mm lens at f/2.8. Been gone for a while. Sorry on that. Life sometimes does that, you know? Truly appreciate all the comments and support even when I wasn’t posting also. Thank you so very much. Here’s another of the abstracts I’ve been doing. If you want to see the other images/posts in the series, please click here and here. Inge (her blog here) recently commented that she was recommending my camera movement abstracts to others who are learning about the technique, and that just pleased me so much, that I decided to post another one. As a reward for watching my neighbor’s adorable Zebra Finch (you can see a normal photo involving another time I watched this wonderful bird here), I was given a vase filled with beautiful flowers. 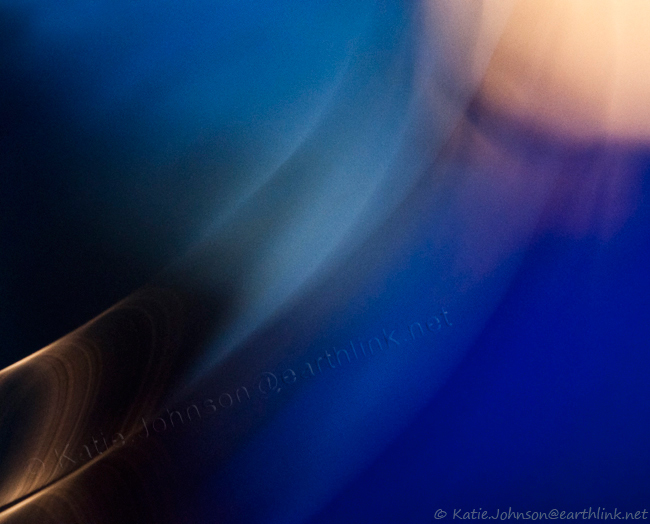 Shot with my 105 mm lens at f/22 with a shutter speed of one second, as I moved the camera in an upward and circular motion. Here’s the 23rd installment of “A Simple Pretty Flower for a Sunday.” If you’d like, you can view all the earlier Sunday flower images/posts on this page. I actually know what these flowers are. 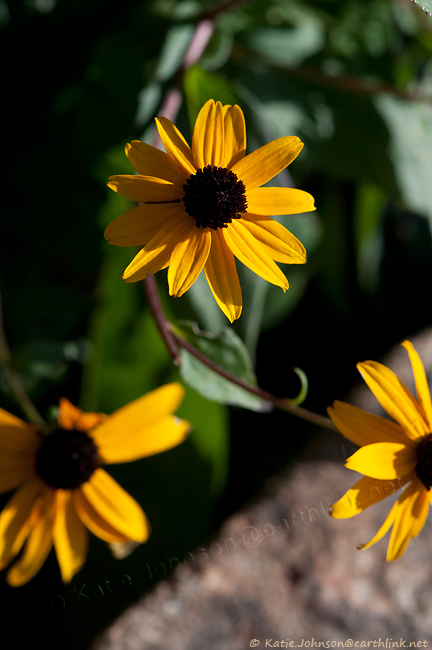 (: They are Black-Eyed Susans that grow at my friend’s house in Tesuque, New Mexico. This photo was taken in the ending days of last summer. This weekend it’s been cold and snowy here, so the warmth of this photo in the early morning sun is needed. And to me, that one flower just stands so proud among the three flowers and that feels special. Shot with my 105mm macro lens at f/8. Oh, the Evil Eye …. I was out in my courtyard the other day and noticed my mint plants were starting to come back (well, actually it was a milder winter, so a few of them never totally left). 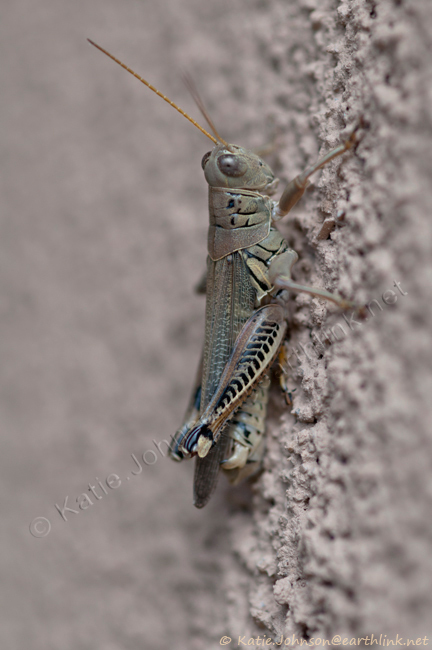 Anyhow, that reminded me of the grasshoppers that would live over in that area. I didn’t mind them munching on my mint, as there is enough to go around. I’m really surprised at how insects will let you get really close with a macro lens while you click away. I’m going to try to take more photos of different ones this year, I think. Shot with my 105mm macro lens at f/5. 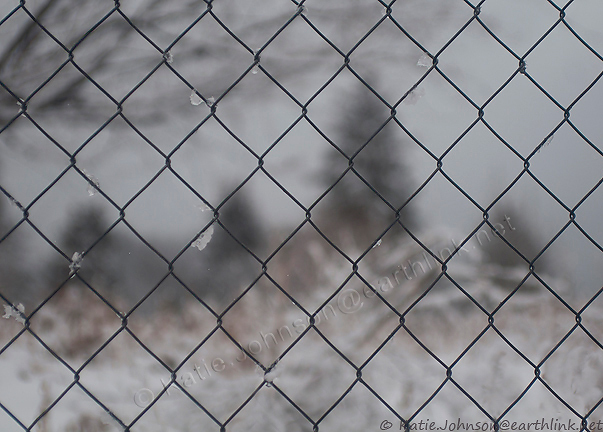 My journey into creative photography and following what my eye sees. All images on this blog are copyright of Katie Johnson and cannot be copied, downloaded or used in any way without express written permission.